I’m excited to announce the General Availability of the Azure Site Recovery (ASR) enhanced VMware to Azure functionality. Customers can now protect and replicate their VMware virtual machines and physical servers to Azure, without the need to deploy any replication or orchestration components in Azure IaaS. 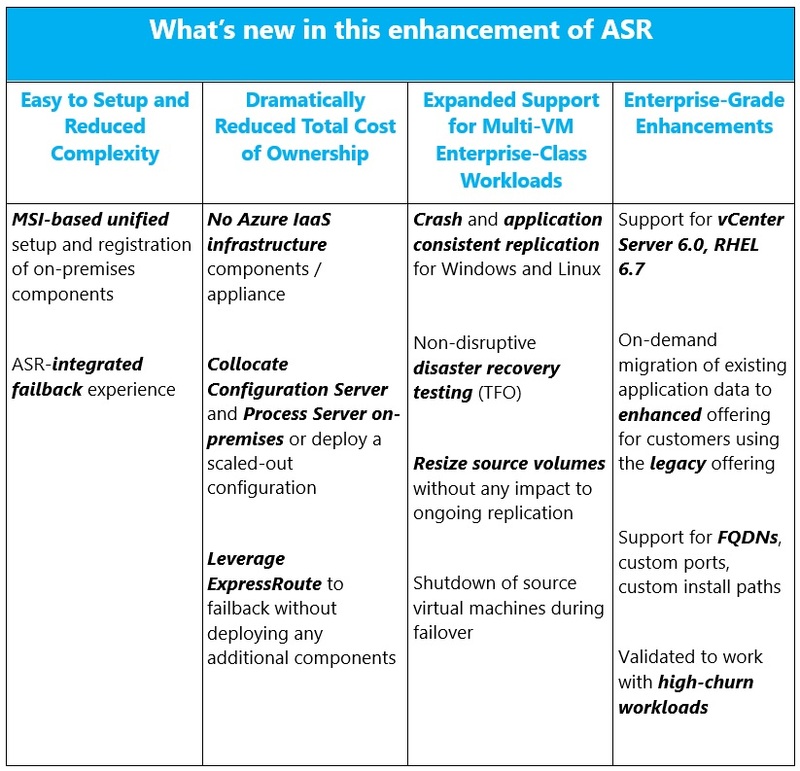 This enhancement to ASR is designed to help drastically reduce the total cost of ownership and dramatically improve manageability and simplicity when customers choose to deploy ASR to replicate, and protect (or migrate) their VMware workloads to Azure. The in-market VMware to Azure scenario – now legacy – will continue to remain available for some time, but we strongly recommend that customers begin using the new enhanced VMware to Azure solution when replicating VMware workloads or physical machines to Azure. The enhanced functionality has been in Private Preview since October 2015, and has successfully passed the rigorous evaluation and validation goals of our early customers, many of whom are already moving their production workloads to the enhanced offering. With marquee customers already on board, and with their early feedback incorporated, ASR’s SLA-backed enhanced VMware to Azure solution is now ready to replicate your on-premises workloads to Azure. With no running IaaS components/appliance, you pay for Azure compute resources only when a failover or migration to Azure is initiated. Application data is replicated to customer’s Azure Storage account to ensure security and isolation, and virtual machines are provisioned in Azure only after a failover or migration is initiated. With MSI-based unified setup of on-premises components, you can configure replication to Azure in a few simple steps without incurring the cost and complexity that traditional replication solutions entail. Our scale-out mode ensures that you can protect multiple high-churn workloads without losing the assurance of ASR’s on-going replication and protection. These enhancements are in addition to features such as heterogeneous workload support, automated VMware vCenter Server discovery, continuous data protection (CDP), one-click failovers with ASR Recovery Plan, and rich health monitoring and e-mail notifications. Azure Site Recovery, as part of Microsoft Operations Management Suite, enables you to gain control and manage your workloads no matter where they run - Azure, AWS, Windows Server, Linux, VMware or OpenStack - with a cost-effective, all-in-one cloud IT management solution. Existing System Center customers can take advantage of the Microsoft Operations Management Suite add-on, empowering them to do more by leveraging their current investments. Get access to all the new services that OMS offers, with a convenient step-up price for all existing System Center customers. You can also access only the IT management services that you need, enabling you to on-board quickly and have immediate value, paying only for the features that you use.